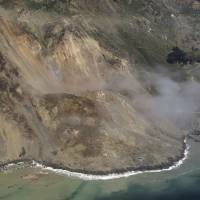 BIG SUR, CALIFORNIA - A massive landslide that went into the Pacific Ocean is the latest natural disaster to hit a California community that relies heavily on an iconic coastal highway and tourism to survive. 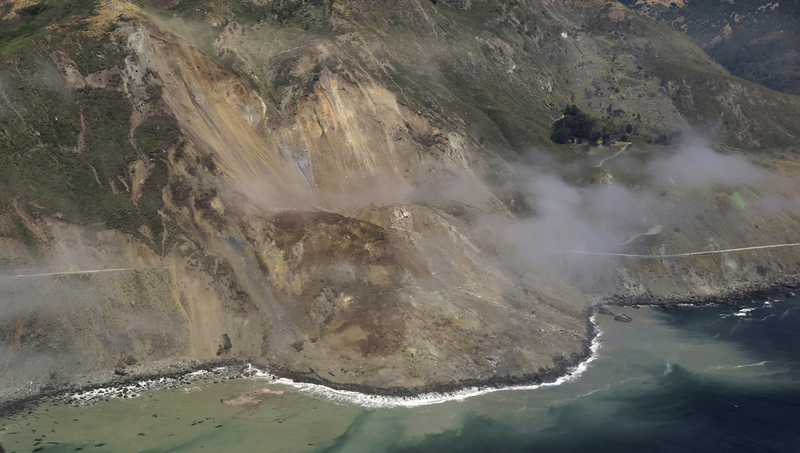 The weekend slide in Big Sur buried a portion of Highway 1 under a 12-meter layer of rock and dirt and changed the coastline below to include what now looks like a rounded skirt hem, Susana Cruz, a spokeswoman with the California Department of Transportation, said Tuesday. More than 1 million tons of rock and dirt tumbled down a saturated slope in an area called Mud Creek. The slide covers a 400-meter stretch of Highway 1, and authorities have no estimate on when it might reopen. The area remains unstable. Narrow, windy Highway 1 through Big Sur is a major tourist draw, attracting visitors to serene groves of redwoods, beaches and the highway’s dramatic oceanside scenery between San Francisco and Los Angeles. But it’s also had its share of damage from Mother Nature. The state already had closed that part of Highway 1 to repair buckled pavement and remove debris after an earlier slide triggered by one of California’s rainiest winters in decades. Authorities removed work crews from the area last week after realizing that saturated soil in that area was increasingly unstable, Cruz said. The rough winter closed at least two other stretches of road in the area, forcing some resorts to shut down and others to use helicopters to ferry in supplies and guests. Gafill said repairing this landslide is not as critical for business as the re-opening of Pfeiffer Canyon Bridge, a span on Highway 1 that was damaged from heavy rain in January and February. The new span is scheduled to open in September.